Specific topics covered include antenuptial agreements, separation agreements, modification agreements, matters relating to infants and incompetents, and service of process. Forms also cover finding of fact and conclusion of law and judgment (with and without children), stipulations of settlement (without children), verified complaint, finding and using an appraiser, order to show cause, and various financial affidavits. 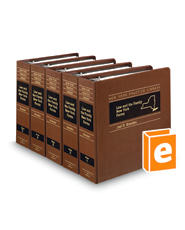 The set includes relevant provisions of New York Civil Practice Law and Rules, Domestic Relations Law, and Court Rules. You'll also find convenient cross-references to the companion Law and the Family New York, 2d.